Spicy dip made with aromatic avocados and protein-rich spirulina. The perfect starter. Peel the avocado, remove the core and mash the pulp with a fork. Then grind Lifefood Spirulina Tablets and mix up the resulting powder with the pulp of the avocado. Depending on your taste, the dip can now be seasoned with salt, pepper, lemon and garlic. Enjoy every moment. Hollow mushrooms and tomatoes. 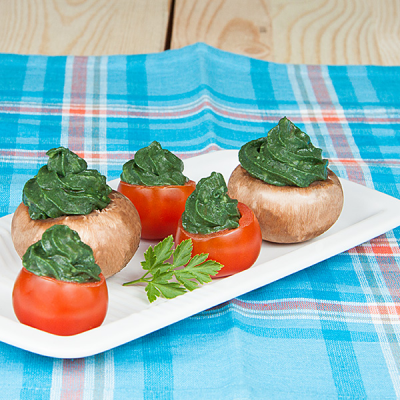 Fill them with your Avocado Spirulina Dip and serve the stuffed vegetables as appetizer or snack.